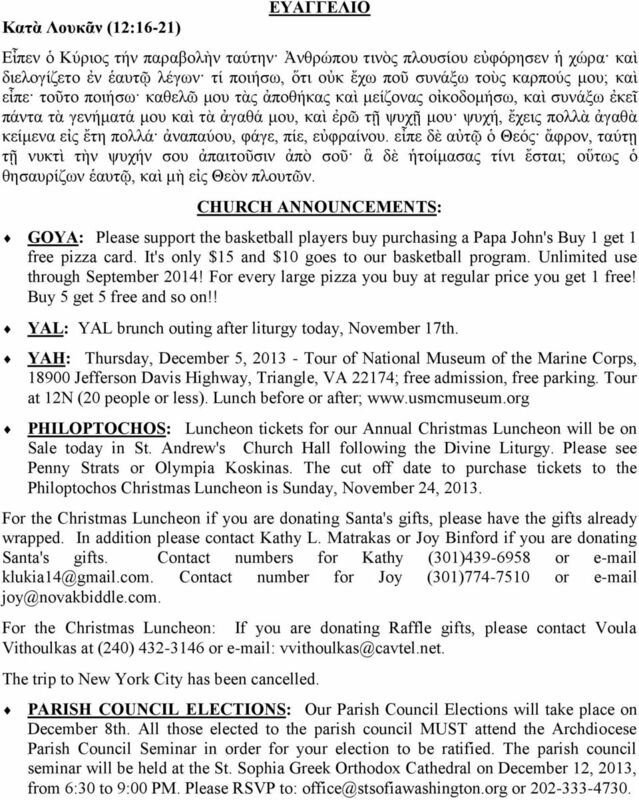 Download "THE MISSION OF THE ST. CONSTANTINE & HELEN GREEK ORTHODOX CHURCH OF WASHINGTON DC"
1 THE MISSION OF THE ST. CONSTANTINE & HELEN GREEK ORTHODOX CHURCH OF WASHINGTON DC IN SILVER SPRING IS TO PROCLAIM THE GOSPEL OF CHRIST, TO TEACH AND SPREAD THE ORTHODOX CHRISTIAN FAITH, TO ENERGIZE, CULTIVATE AND GUIDE THE LIFE OF THE CHURCH ACCORDING TO THE ORTHODOX CHRISTIAN FAITH AND SACRED TRADITION. THE CHURCH SANCTIFIES THE FAITHFUL THROUGH THE DIVINE WORSHIP, ESPECIALLY THE HOLY EUCHARIST AND OTHER SACRAMENTS, BUILDING THE SPIRITUAL AND ETHICAL LIFE OF THE FAITHFUL IN ACCORDANCE WITH THE HOLY SCRIPTURES, SACRED TRADITION, THE DOCTRINES AND CANONS OF THE ECUMENICAL AND LOCAL SYNODS, THE CANONS OF THE HOLY APOSTLES AND FATHERS OF THE CHURCH AND OF ALL OTHER SYNODS RECOGNIZED BY THE ORTHODOX CHURCH, AS INTERPRETED BY THE GREAT CHURCH OF CHRIST IN CONSTANTINOPLE. THE CHURCH SERVES AS A BEACON, CARRIER AND WITNESS OF THE MESSAGE OF CHRIST TO ALL PERSONS, THROUGH DIVINE WORSHIP, PREACHING, TEACHING AND LIVING THE ORTHODOX CHRISTIAN FAITH. 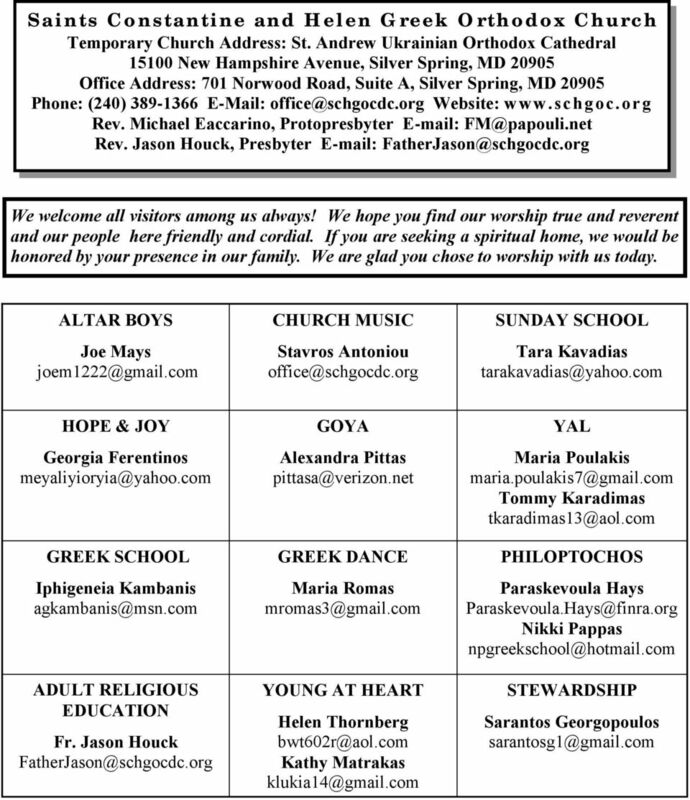 4 PRAYER LIST If you would like us to remember you or your loved one in our prayers, please contact the office. PRAYER FOR A SICK PERSON Heavenly Father, physician of our souls and bodies, who have sent Your only-begotten Son and our Lord Jesus Christ to heal every sickness and infirmity, visit and heal me Your servant from all physical and spiritual ailments through the grace of Your Christ. Grant me patience in this sickness, strength of body and spirit, and recovery of health. Lord, You have taught us through Your word to pray for each other that we may be healed. I pray that You heal me as Your servant and grant me the gift of complete health. For You are the source of healing and to You I give glory, Father, Son and Holy Spirit. Amen. 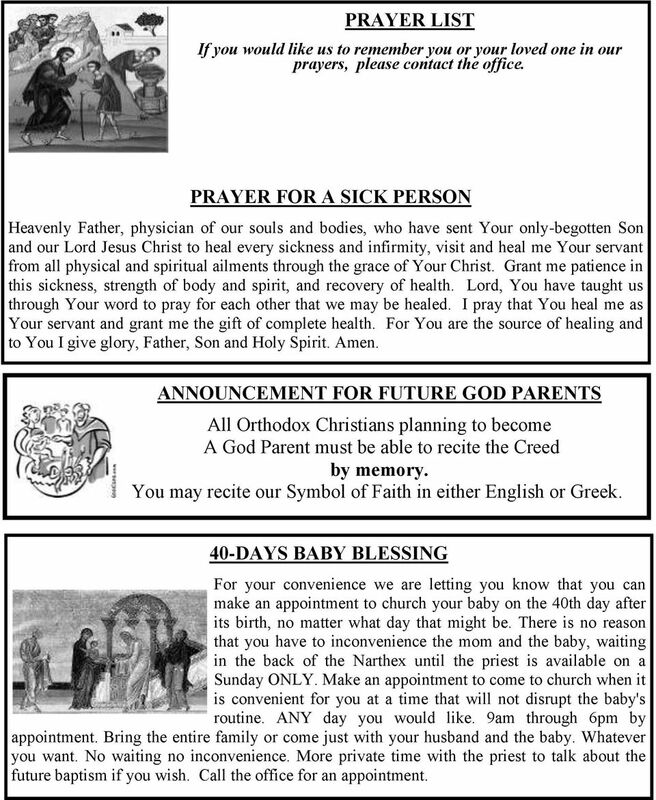 ANNOUNCEMENT FOR FUTURE GOD PARENTS All Orthodox Christians planning to become A God Parent must be able to recite the Creed by memory. You may recite our Symbol of Faith in either English or Greek. 40-DAYS BABY BLESSING For your convenience we are letting you know that you can make an appointment to church your baby on the 40th day after its birth, no matter what day that might be. 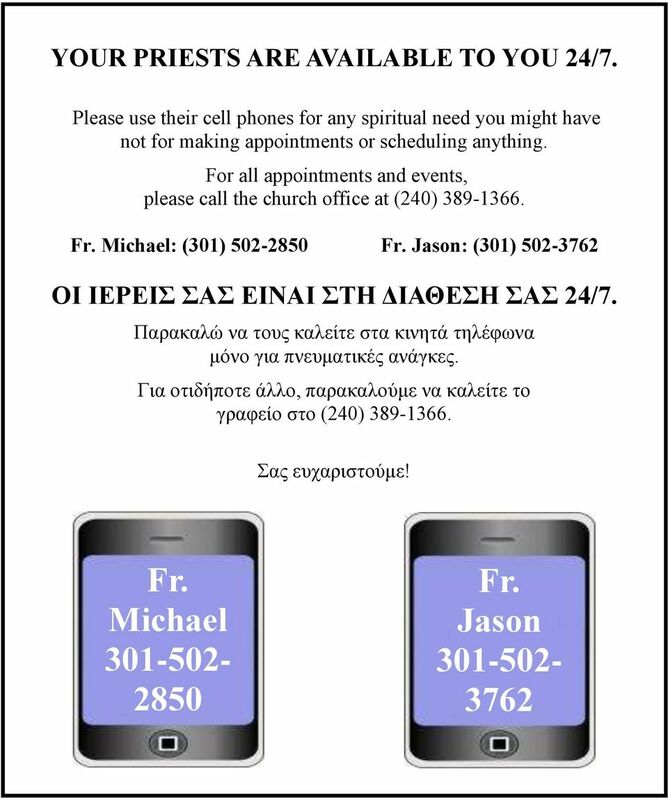 There is no reason that you have to inconvenience the mom and the baby, waiting in the back of the Narthex until the priest is available on a Sunday ONLY. Make an appointment to come to church when it is convenient for you at a time that will not disrupt the baby's routine. ANY day you would like. 9am through 6pm by appointment. Bring the entire family or come just with your husband and the baby. Whatever you want. No waiting no inconvenience. More private time with the priest to talk about the future baptism if you wish. Call the office for an appointment. 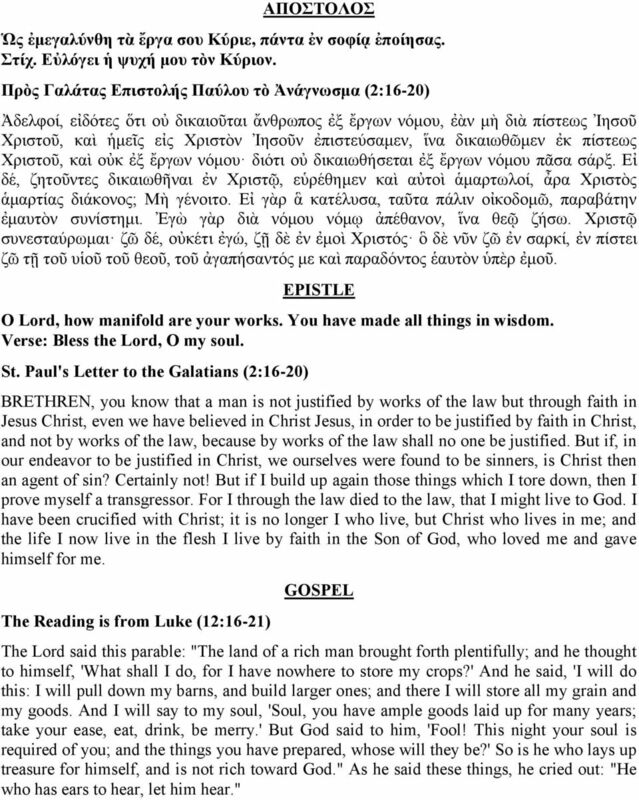 5 November 17, th Sunday of Luke - Θ Κυριακή Λουκά The NICENE CREED will be read in ENGLISH today Αναστάσιμο Απολυτίκιον - Δ Ήχος Τὸ φαιδρὸν τῆς Ἀναστάσεως κήρυγμα, ἐκ τοῦ Ἀγγέλου μαθοῦσαι αἱ τοῦ Κυρίου Μαθήτριαι, καὶ τὴν προγονικὴν ἀπόφασιν ἀπορρίψασαι, τοῖς Ἀποστόλοις καυχώμεναι ἔλεγον Ἐσκύλευται ὁ θάνατος, ἠγέρθη Χριστὸς ὁ Θεός, δωρούμενος τῷ κόσμῳ τὸ μέγα ἔλεος. Aπολυτίκιον Αγ. Κωνσταντίνου & Ελένης Τοῦ Σταυροῦ σου τὸν τύπον ἐν οὐρανῷ θεασάμενος, καὶ ὡς ὁ Παῦλος τὴν κλήσιν οὐκ ἐξ ἀνθρώπων δεξάμενος, ὁ ἐν βασιλεύσιν, Ἀπόστολός σου Κύριε, Βασιλεύουσαν πόλιν τὴ χειρί σου παρέθετο ἣν περίσωζε διὰ παντὸς ἐν εἰρήνῃ, πρεσβείαις τῆς Θεοτόκου, μόνε Φιλάνθρωπε. Aπολυτίκιον Αγ. Ανδρέα Ὡς τῶν Ἀποστόλων Πρωτόκλητος, καὶ τοῦ Κορυφαίου αὐτάδελφος, τὸν Δεσπότην τῶν ὅλων Ἀνδρέα ἱκέτευε, εἰρήνην τὴ οἰκουμένη δωρήσασθαι, καὶ ταὶς ψυχαὶς ἡ μῶν τὸ μέγα ἔλεος. Κοντάκιον - Δ Ήχος Ο καθαρώτατος ναός τού Σωτήρος, η πολυτίμητος παστάς καί Παρθένος, τό Ιερόν θησαύρισμα τής δόξης τού Θεού, σήμερον εισάγεται, εν τώ οίκω Κυρίου, τήν χάριν συνεισάγουσα, τήν εν Πνευματι θείω, ήν ανυμνούσιν Άγγελοι Θεού, Αύτη υπάρχει σκηνή επουράνιος. HYMNS OF THE WEEK Resurrectional Apolytikion - 4th Tone Having learned the joyful proclamation of the Resurrection from the Angel, and having cast off the ancestral condemnation, the women disciples of the Lord spake to the Apostles exultantly: Death is despoiled and Christ God is risen, granting great mercy to the world. 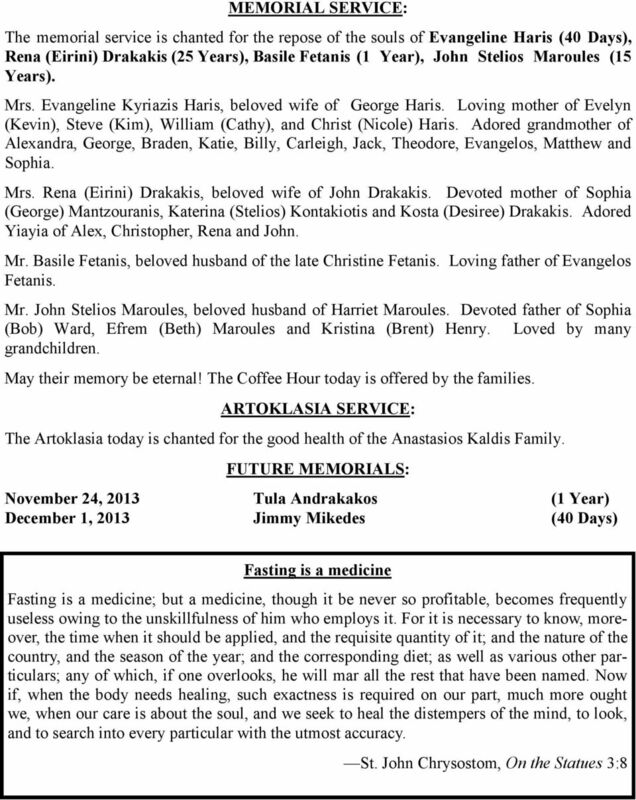 Apolytikion of Sts. 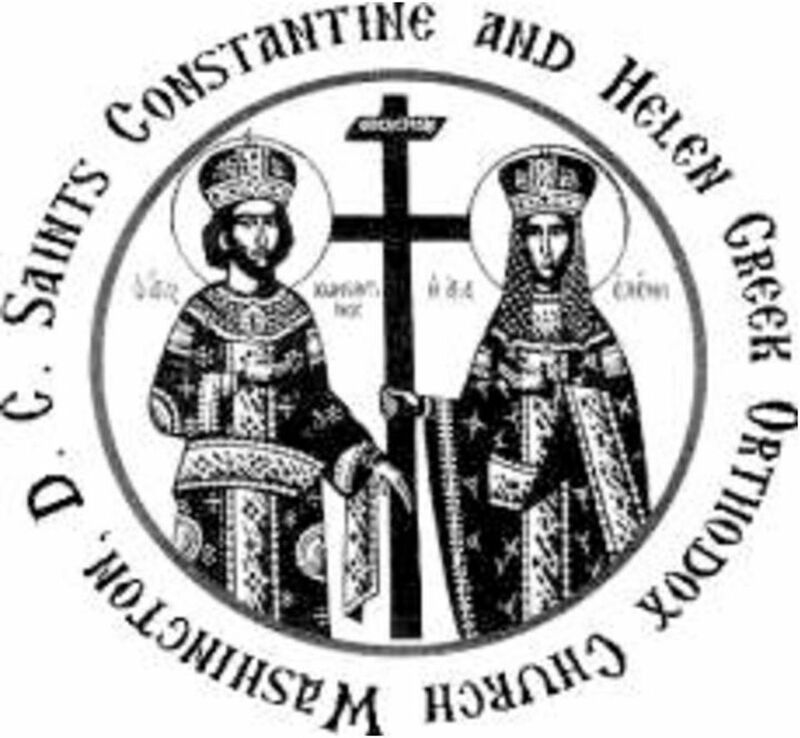 Constantine & Helen Having seen the image of Thy Cross in Heaven, and like Paul, having received the call not from men, Thine apostle among kings entrusted the commonwealth to Thy hand, O Lord. Keep us always in peace, by the intercessions of the Theotokos, O only Friend of man. Apolytikion of St. Andrew As first of the Apostles to be called, O Andrew, brother of him (Peter) who was foremost, beseech the Master of all to grant the world peace and our souls great mercy. Seasonal Kontakion - Fourth Tone Today, the most pure temple of the Savior, the precious bridal chamber and Virgin, the sacred treasure of God, enters the house of the Lord, bringing the grace of the Divine Spirit. The Angels of God praise her. She is the heavenly tabernacle. 6 ΑΠΟΣΤΟΛΟΣ Ὡς ἐμεγαλύνθη τὰ ἔργα σου Κύριε, πάντα ἐν σοφίᾳ ἐποίησας. Στίχ. Εὐλόγει ἡ ψυχή μου τὸν Κύριον. Πρὸς Γαλάτας Επιστολής Παύλου τὸ Ἀνάγνωσμα (2:16-20) Ἀδελφοί, εἰδότες ὅτι οὐ δικαιοῦται ἄνθρωπος ἐξ ἔργων νόμου, ἐὰν μὴ διὰ πίστεως Ἰησοῦ Χριστοῦ, καὶ ἡμεῖς εἰς Χριστὸν Ἰησοῦν ἐπιστεύσαμεν, ἵνα δικαιωθῶμεν ἐκ πίστεως Χριστοῦ, καὶ οὐκ ἐξ ἔργων νόμου διότι οὐ δικαιωθήσεται ἐξ ἔργων νόμου πᾶσα σάρξ. Εἰ δέ, ζητοῦντες δικαιωθῆναι ἐν Χριστῷ, εὑρέθημεν καὶ αὐτοὶ ἁμαρτωλοί, ἆρα Χριστὸς ἁμαρτίας διάκονος; Μὴ γένοιτο. Εἰ γὰρ ἃ κατέλυσα, ταῦτα πάλιν οἰκοδομῶ, παραβάτην ἐμαυτὸν συνίστημι. Ἐγὼ γὰρ διὰ νόμου νόμῳ ἀπέθανον, ἵνα θεῷ ζήσω. Χριστῷ συνεσταύρωμαι ζῶ δέ, οὐκέτι ἐγώ, ζῇ δὲ ἐν ἐμοὶ Χριστός ὃ δὲ νῦν ζῶ ἐν σαρκί, ἐν πίστει ζῶ τῇ τοῦ υἱοῦ τοῦ θεοῦ, τοῦ ἀγαπήσαντός με καὶ παραδόντος ἑαυτὸν ὑπὲρ ἐμοῦ. EPISTLE O Lord, how manifold are your works. You have made all things in wisdom. Verse: Bless the Lord, O my soul. St. Paul's Letter to the Galatians (2:16-20) BRETHREN, you know that a man is not justified by works of the law but through faith in Jesus Christ, even we have believed in Christ Jesus, in order to be justified by faith in Christ, and not by works of the law, because by works of the law shall no one be justified. But if, in our endeavor to be justified in Christ, we ourselves were found to be sinners, is Christ then an agent of sin? Certainly not! But if I build up again those things which I tore down, then I prove myself a transgressor. For I through the law died to the law, that I might live to God. I have been crucified with Christ; it is no longer I who live, but Christ who lives in me; and the life I now live in the flesh I live by faith in the Son of God, who loved me and gave himself for me. The Reading is from Luke (12:16-21) GOSPEL The Lord said this parable: "The land of a rich man brought forth plentifully; and he thought to himself, 'What shall I do, for I have nowhere to store my crops?' And he said, 'I will do this: I will pull down my barns, and build larger ones; and there I will store all my grain and my goods. And I will say to my soul, 'Soul, you have ample goods laid up for many years; take your ease, eat, drink, be merry.' But God said to him, 'Fool! This night your soul is required of you; and the things you have prepared, whose will they be?' So is he who lays up treasure for himself, and is not rich toward God." As he said these things, he cried out: "He who has ears to hear, let him hear." 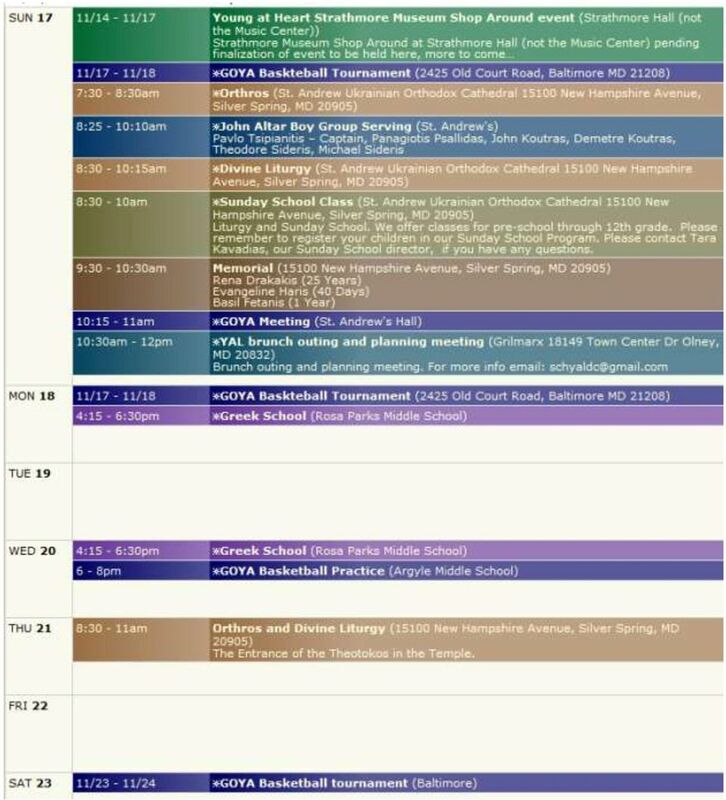 9 ALTAR BOYS SCHEDULE MATTHEW : Captain: Nicholas Gerakis, Matthew Green, Steven Green, Alex Tzamaras MARK : Captain: Mike Pittas, Gabriel Psallidas, Andrew Ward, Andrew Nixon LUKE : Captain: Dimitri Lappas, Zack Ferentinos, Alex Mantzouranis, Christopher Mantzouranis JOHN : Captain: Pavlo Tsipianitis, Panagiotis Psallidas, John Koutras, Demetre Koutras, Theodore Sideris, Michael Sideris November 3 - Mark November 10 - Luke November 17 - John November 24 - Matthew December 1 - Mark December 8 - Luke December 15 - John December 22 - Matthew December 29 - Mark PARISH COUNCIL ELECTIONS: Elections for the Parish Council will be held on December 8, 2013, in the Church Hall. 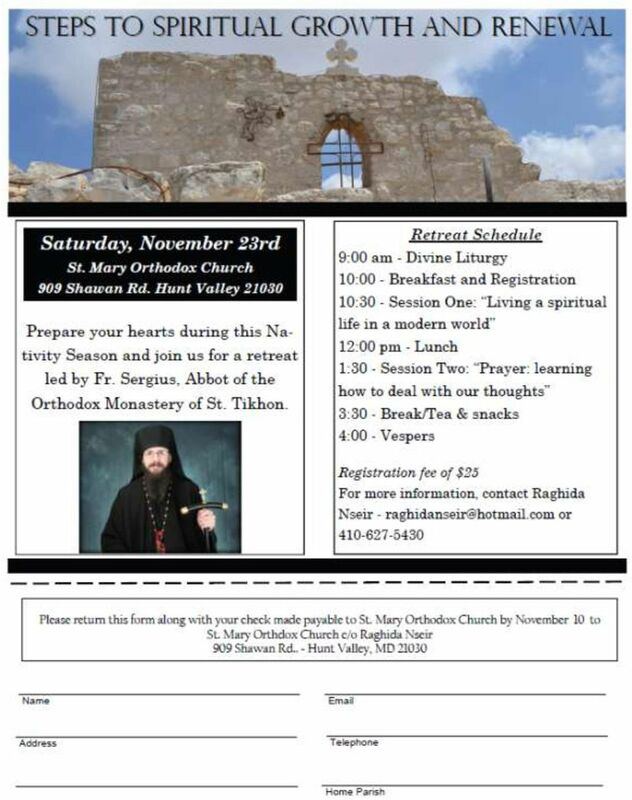 Voting will be by secret ballot and will commence at 8AM, close during the Divine Liturgy resume immediately after the Divine Liturgy and terminate at 2:00 PM that day. 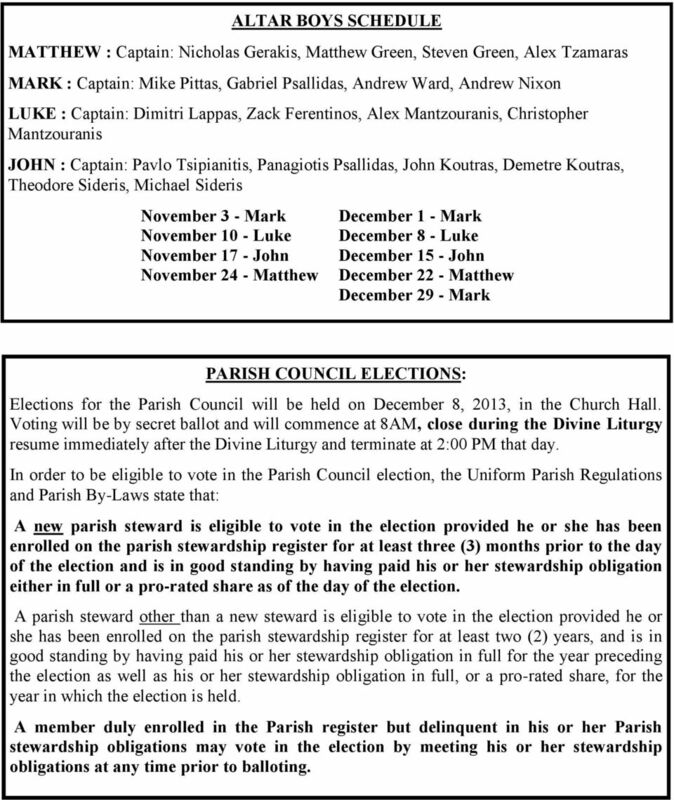 In order to be eligible to vote in the Parish Council election, the Uniform Parish Regulations and Parish By-Laws state that: A new parish steward is eligible to vote in the election provided he or she has been enrolled on the parish stewardship register for at least three (3) months prior to the day of the election and is in good standing by having paid his or her stewardship obligation either in full or a pro-rated share as of the day of the election. A parish steward other than a new steward is eligible to vote in the election provided he or she has been enrolled on the parish stewardship register for at least two (2) years, and is in good standing by having paid his or her stewardship obligation in full for the year preceding the election as well as his or her stewardship obligation in full, or a pro-rated share, for the year in which the election is held. A member duly enrolled in the Parish register but delinquent in his or her Parish stewardship obligations may vote in the election by meeting his or her stewardship obligations at any time prior to balloting. 11 eptahmeron. Under the influence of Great Lent, however it was extended to forty days as well but with the strictness of the first. How should we keep the fast? For the period of the forty days we should not eat meat, dairy products and eggs. It is permitted to have fish every day, except for Wednesday and Friday, from the beginning of the fast until December 17 th. It is permitted to have fish every day, except for Wednesday and Friday, from the beginning of the fast until December 17 th. 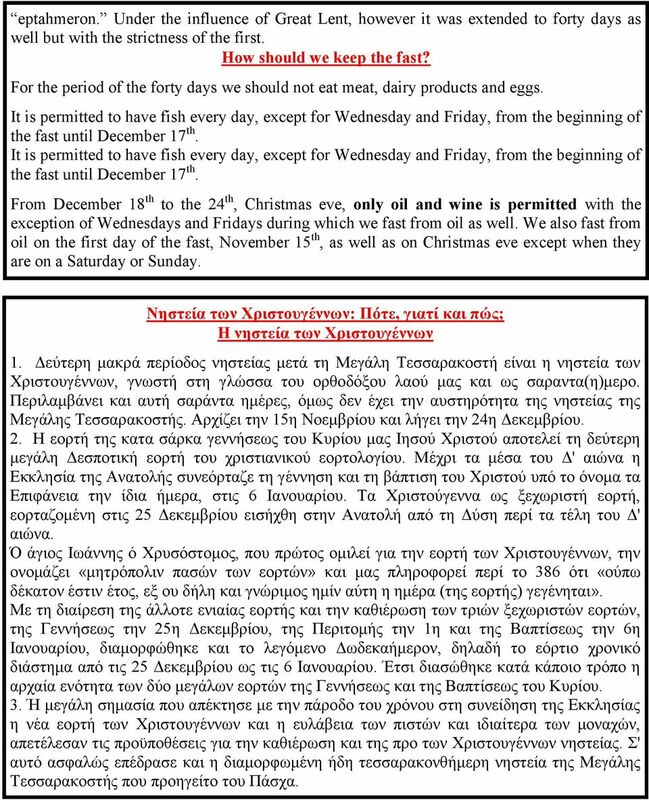 From December 18 th to the 24 th, Christmas eve, only oil and wine is permitted with the exception of Wednesdays and Fridays during which we fast from oil as well. 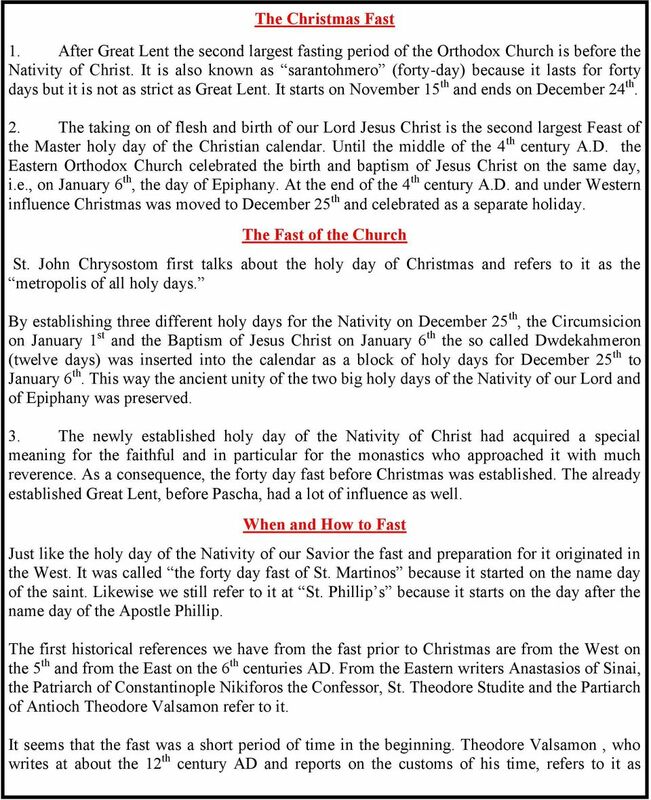 We also fast from oil on the first day of the fast, November 15 th, as well as on Christmas eve except when they are on a Saturday or Sunday. Νηστεία των Χριστουγέννων: Πότε, γιατί και πώς; H νηστεία των Χριστουγέννων 1. Δεύτερη μακρά περίοδος νηστείας μετά τη Μεγάλη Τεσσαρακοστή είναι η νηστεία των Χριστουγέννων, γνωστή στη γλώσσα του ορθοδόξου λαού μας και ως σαραντα(η)μερο. Περιλαμβάνει και αυτή σαράντα ημέρες, όμως δεν έχει την αυστηρότητα της νηστείας της Μεγάλης Τεσσαρακοστής. Αρχίζει την 15η Νοεμβρίου και λήγει την 24η Δεκεμβρίου. 2. Η εορτή της κατα σάρκα γεννήσεως του Κυρίου μας Ιησού Χριστού αποτελεί τη δεύτερη μεγάλη Δεσποτική εορτή του χριστιανικού εορτολογίου. Μέχρι τα μέσα του Δ' αιώνα η Εκκλησία της Ανατολής συνεόρταζε τη γέννηση και τη βάπτιση του Χριστού υπό το όνομα τα Επιφάνεια την ίδια ήμερα, στις 6 Ιανουαρίου. Τα Χριστούγεννα ως ξεχωριστή εορτή, εορταζομένη στις 25 Δεκεμβρίου εισήχθη στην Ανατολή από τη Δύση περί τα τέλη του Δ' αιώνα. Ό άγιος Ιωάννης ό Χρυσόστομος, που πρώτος ομιλεί για την εορτή των Χριστουγέννων, την ονομάζει «μητρόπολιν πασών των εορτών» και μας πληροφορεί περί το 386 ότι «ούπω δέκατον έστιν έτος, εξ ου δήλη και γνώριμος ημίν αύτη η ημέρα (της εορτής) γεγένηται». Με τη διαίρεση της άλλοτε ενιαίας εορτής και την καθιέρωση των τριών ξεχωριστών εορτών, της Γεννήσεως την 25η Δεκεμβρίου, της Περιτομής την 1η και της Βαπτίσεως την 6η Ιανουαρίου, διαμορφώθηκε και το λεγόμενο Δωδεκαήμερον, δηλαδή το εόρτιο χρονικό διάστημα από τις 25 Δεκεμβρίου ως τις 6 Ιανουαρίου. Έτσι διασώθηκε κατά κάποιο τρόπο η αρχαία ενότητα των δύο μεγάλων εορτών της Γεννήσεως και της Βαπτίσεως του Κυρίου. 3. Ή μεγάλη σημασία που απέκτησε με την πάροδο του χρόνου στη συνείδηση της Εκκλησίας η νέα εορτή των Χριστουγέννων και η ευλάβεια των πιστών και ιδιαίτερα των μοναχών, απετέλεσαν τις προϋποθέσεις για την καθιέρωση και της προ των Χριστουγέννων νηστείας. Σ' αυτό ασφαλώς επέδρασε και η διαμορφωμένη ήδη τεσσαρακονθήμερη νηστεία της Μεγάλης Τεσσαρακοστής που προηγείτο του Πάσχα.